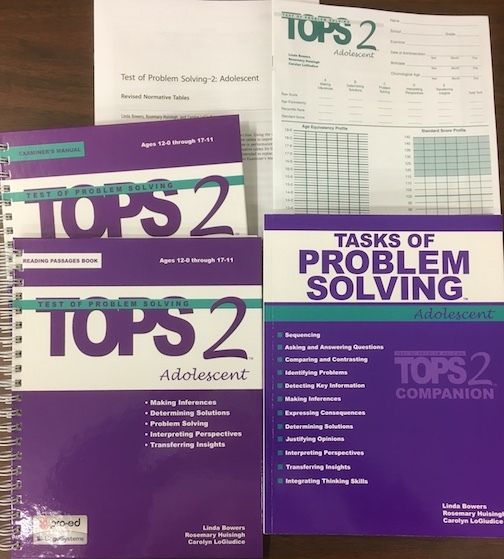 TOPS 2 Adolescent: Book was developed by the authors of Test of Problem Solving (TOPS) to help students become more thoughtful or to practice the language patterns they need to express their ideas fluently. For teaching and remediating expressive language and problem solving skills. Includes instructor's guidelines & student activities for the following: Sequencing, Asking and Answering Questions, Comparing and Contrasting, Identifying Problems, Detecting Key Information, Making Inferences, Expressing Consequences, Determining Solutions, Justifying Opinions, Interpreting Perspectives, Transferring Insights, Integrating Thinking Skills. Extra support includes a glossary of vocabulary for problem solving, outline of Richard Paul's higher-order thinking skills, attributes of Art Costa's sixteen attributes of Habits of Mind, and overview of Piaget's Concrete and Formal Operational States of Development. Professional kit includes: Task of Problem Solving: Adolescent; Test Set includes: examiner's manual, reading passages book, 20 test forms. Circulation restricted to Keystone AEA Special Education staff.